Sound good? 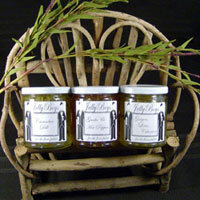 Check out our savoury jellies - they complement the simplest appetizer as well as the most delicious main course. Our jellies are all natural, with no artifical additives or preservatives, no sodium, cholesterol or fat and only 15 calories per serving! Looking for that perfect gift? Gift baskets work for any season and any holiday of the year! 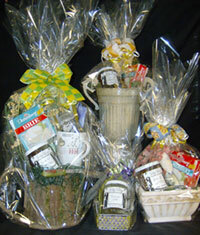 Valentine's Day, Easter, Rosh Hashana, Hannukah, Christmas - we've made baskets for them all! Got a special occasion? We can also make gifts baskets to order.